More on John Pemberton’s possible China 1940s diplomat. This entry was posted on Saturday, January 19th, 2013 at 9:34 pm and is filed under Ancient & Modern, China, Diplomatic, Historic, Taiwan. You can follow any responses to this entry through the RSS 2.0 feed. You can leave a response, or trackback from your own site. Could the “MR” be № in some form? 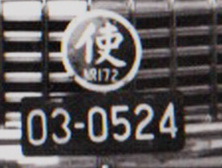 Perhaps the round plaque indicates that the person is Ambassador number 172, or that the car has Ambassador registration number 172? What looks like “MR” or “№” could perhaps in fact be a Chinese character. Did Yun Li have anything to say about it? David and Alex – I see what you mean about the sign for ‘number’. Let me press Yun Li on the matter, in case it IS a Chinese ideogram.